Whose Fault Is It You’re So Overweight? So, have you figured out, yet, why you are so overweight? I’m asking because a good friend is going through a pretty rough stage in her life. I’ve known her for more than 25 years, and what a long, strange trip it’s been. On the surface, we seem to have zero in common: Ethnicity, family history, education, height, weight – well, depending on what year – and a bunch of other you-name-its. Our paths have only crossed twice: When we met, and when we ended up in the same newsroom for a time. And yet, we seem to be kindred spirits. Our lives don’t intersect, but they’re parallel. And through the magic of Facebook we’ve reconnected, sharing drama, again, dealing with similar issues. Again. But her message to me this a.m. really angered me. Her youngest daughter is blaming her for being overweight. This, at a time my friend is finally – finally! – moving toward divorce. Let’s pause for a moment and take this all in . . . Divorce is no joke. I’m not sure how many years she’s been married, but as I said, parallel lives, so I’m guessing at least 22 years. That’s a long time to be with someone with addictions and other issues. Me, I would have bailed a long time ago. That’s just another in the many ways we’re different: You never have to guess what she’s thinking or feeling. She’s passionate, visceral and intuitive. Me, I’m intuitive, and good at masking emotion when necessary. That allows me to resist picking up other people’s emotional baggage. To do otherwise is wearying. So emotionally, let’s just say I really, really want to pick up, say, a small, carry-on piece of baggage of hers, and fling it across the street. That piece being her daughter. Bless her heart; my friend has raised some amazing, talented children, but the Blame Game? Seriously? And at a time like this? My friend’s weight has fluctuated wildly over the years, but her blues ain’t like mine. And yes, this daughter is overweight. She’s also a young adult, and therefore 100 percent responsible for her actions. Given what I’ve told you about my friend’s emotive sentience and the unfortunate marital situation, perhaps you, too, can imagine a child in such an atmosphere developing an eating disorder. Sometimes, the strongest cravings for comfort foods occur when you’re emotionally weakest. I totally get that. What I don’t get is how, in this era of Oprah, Dr. Phil, Dr. Oz, Tyra and hell, Sesame Street; in this age of dozens of wellness websites and hundreds of self-help books , one can blame one’s mother for being obese – as if staying with this man was part of some evil plot to ruin her life. My mother and father (when he was alive) blamed themselves for all the sexual, physical and psychological abuse I suffered as a child. OK, sure, they played an indirect role of some sort, but let’s be honest: How can a child effectively communicate all that is going on, especially when she comes from a household that demands you respect your elders? Geez, I’m still saying “Yes, ma’am” to everyone. And if, as a parent, you have not been trained to spot the signs of possible abuse, depression or eating disorders, is it really all your fault? So . . . who’s to blame? And once you’ve figured that out . . . so what? What matters is where you are today. The daughter is overweight. I say to her and the similarly situated: It is critical to acknowledge and understand the past or you are indeed doomed to repeat it. Please get help for your journey to truth. Let others help you with that baggage. Someone once said a load shared is a load halved, or words to that effect. Just keep it moving . . . forward. Sorry, folks, but you’ve got to go some to get much sympathy from me these days. So many of us our wearing our emotional issues around our waistlines, aren’t we? If you have issues like mine – which includes the fear that losing weight means losing protection –we’ve got the makings of a melodrama. Except I don’t cotton much to drama of any sort. Sometimes, life is unfair. At those times, it’s hard to remember that we choose our reactions. So I gave myself a little time for a little anger, a little sadness, then moved on. Moving on isn’t always easy, but it’s always better. Of course, I was talking about something completely different, but I think it applies. I know why I’m overweight, oversexed, have a handful of irrational fears – some so strange, they’re actually quite funny, which is why I thank God for my sense of humor – and why, sometimes, chocolate really does seem to be the answer to life’s stresses. I also know how my issues can sabotage my own weight-loss efforts. That awareness is why I’m succeeding (slowly but surely). So OK, daughter of friend and people everywhere. 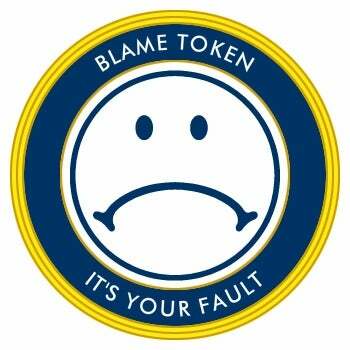 Blame whomever, but you’d better recognize: It’s up to you, and you alone, to do something about it. Get some help. Halve your load, and move on.